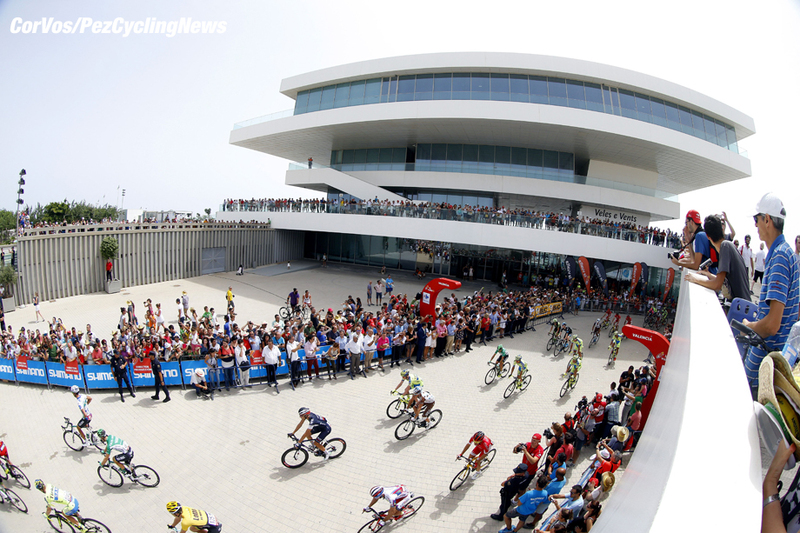 PezCycling News - What's Cool In Road Cycling : Vuelta’15 St.10: Sbaragli The Poet! 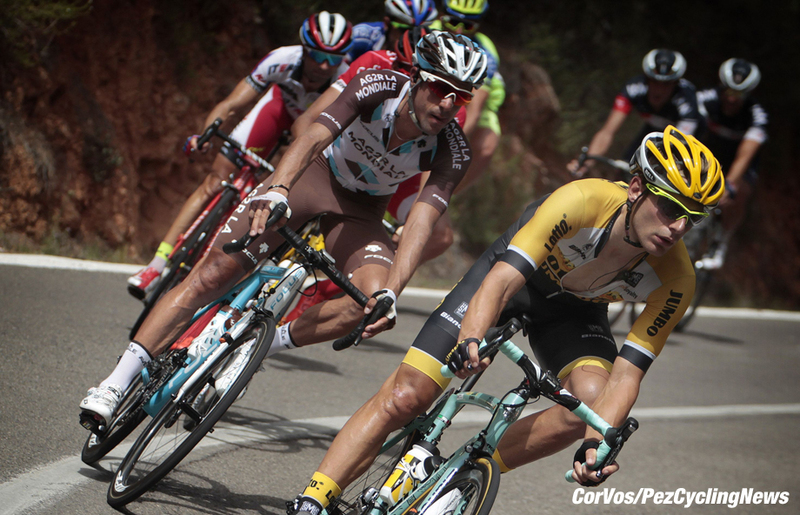 Vuelta’15 St.10: Sbaragli The Poet! Race Report: On a day that was expected to go to the sprinters, and favorite John Degenkolb in particular, it all came down to a messy, scrappy finish with a young rider from the best young team of the year taking his first professional win. Kristian Sbaragli of MTN-Qhubeka outfoxed everyone and gave the African squad yet another famous win. We’re one day away from the rest day and for most of the riders it can’t come soon enough. It’s been a first week of high drama and even higher climbs, and we’ve not even reached the northwest yet. Riders have hit the ground, hit the barriers and hit the race vehicles. As the day started 182 riders rode out of Valencia on route to Castellón but this was soon to change as Australian wunderkind, and stage winner, Caleb Ewan (Orica-GreenEDGE) was suffering at the back…50km in and he was gone. Climbing through the hillier section in the early portion of the stage, several riders made bids to get away, including one from perennial trier Sylvain Chavanel (IAM-Cycling) but eventually a group of 37 rode away. With only 182 riders in the race this should really have been described as a split in the peloton but all the GC riders were in the second group. Three more riders rode in no-mans land for a while before finally making contact with the lead bunch. This group had a rider, or riders, from just about every team so there was every chance that the sprinters would sit back, the GC contenders would sit back and the race would roll towards the rest day. Of course this also meant that Tom Dumoulin’s Red Jersey was under threat from Sergio Henao who was 3:13 away from the race lead. Giant-Alpecin had announced that they wanted to defend the jersey and go for a stage win with John Degenkolb but with two riders in the break that may have changed. The riders involved were: Dario Cataldo, Matteo Montaguti, Sergio Henao, Carlos Verona, Riccardo Zoidl, Tiago Machado, Daniel Navarro, Peter Velits, Lawson Craddock, Rubén Plaza, Martijn Keizer, Luis León Sánchez, Larry Warbasse, Imanol Erviti, David Arroyo, Natnael Berhane, Jurgen Van den Broeck, Romain Hardy, Tsgabu Grmay, Andrey Amador, Pello Bilbao, Eduard Vorganov, Carlos Quintero, Maxime Monfort, Ian Boswell, Salvatore Puccio, Benjamin King, Kenny Elissonde, Stephen Cummings, Cameron Meyer, Amael Moinard, George Bennett, Darwin Atapuma, Ángel Madrazo, Mickael Cherel, Davide Villella and Rodolfo Torres. The last three riders to make the join were Johannes Frohlinger, Jérôme Cousin and Jay McCarthy. Eventually two riders broke clear of the lead group and Riccardo Zoidl (Trek Factory Racing) and Carlos Verona (Etixx - Quick-Step) slowly built up a lead of 55 seconds but with so many behind it was never going to happen. Zoidl was caught while Verona tried to make a move to stay away but he was reeled in too. The chasing peloton wasn’t that far behind and as they came out of the hills and down onto the plain the leaders only had an advantage of 1:25. It was hoped that the break would be given its head while the GC riders took a day off but with so many riders separated by just a handful of seconds in the overall standings nobody was taking chances. The peloton was closing fast and the lead group split into three as some riders headed backwards. A group containing Cameron Meyer (Orica-GreenEDGE) and Luis Leon Sanchez (Astana) lost contact and some of them were soon picked up by the bunch. Thirty riders were now together up front with the peloton at 1:20 but as the main players and their teams continued to push the gap started dropping again…one minute and then, very quickly, 50 seconds. Six riders rode away from the thirty but, like an ocean wave, another eight swept across to make it fourteen in front. Most of the chasing behind was being done by Giant-Alpecin with their two-pronged attack plan for the day but they were also being helped by Trek Factory Racing. 55km to go and it was all back together, the leaders having been caught. There had been a slight split in the peloton in the heat of the chase but everything came together as they ran towards the feed-station at Villarreal. The riders were desperate for this rest day and only had one more climb to get over before the run-in to the finish. Tiredness, nervousness, heat and the thought of a day off were maybe the cause of a couple of crashes with Nicolas Roche (Team Sky) being one to hit the ground and having to make a quick trip to the medical car. He was helped back to the bunch by Puccio just as Movistar took up the pace at the front. With Valverde crashing late on yesterday there was concern that his shoulder would give him trouble today but he’s a wily character and if it was troubling him he wasn’t letting on. Niki Terpstra (Etixx - Quick-Step) took off from the front of the bunch in an attempt to solo to the finish and he was chased by a second group of six. With the peloton not letting up, his attack lasted for 13km but eventually he was reeled in as they passed through Benicássim, the chasers already back in the pack. They were heading towards the 2nd category climb of the Alto del Desierto de las Palmas and Movistar was clicking along at a fair pace to keep their top men ahead of any crashes. 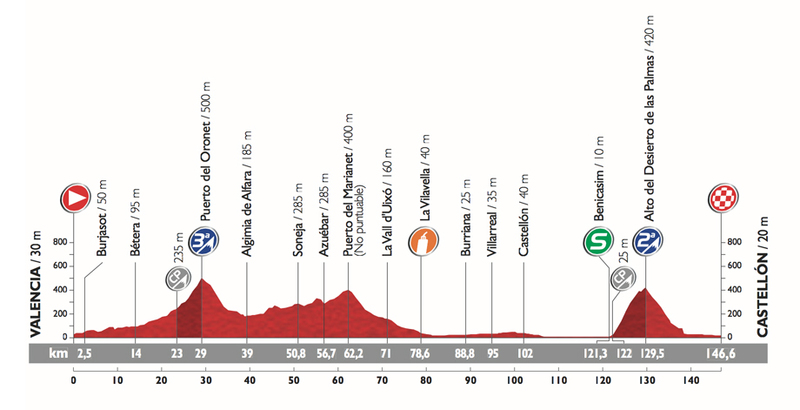 The climb was 7km long but with a 17km run from the summit to the finish it was now looking like a sprinters’ delight. With a smooth surface and a regular gradient a couple of riders tried to gain an advantage over the summit. Alessandro De Marchi (BMC) set off up the road and was soon joined by Romain Sicard (Europcar) and they were chased by Kenny Elissonde (FDJ.fr) and Jérôme Coppel (IAM Cycling). Elissonde dropped Coppel, caught and passed the other two but as they crested the summit all three came together, chased by Gianluca Brambilla (Etixx - Quick-Step). The advantage was small with all of the GC riders chasing…Dumoulin himself at the front of Giant-Alpecin for Degenkolb. Fast descent and two Team Sky riders hit the deck with Henao requiring a bike change. Three riders in front by 24 seconds but with the sprint teams lining up behind, it looked hopeless for the escapees but very good for Degenkolb…particularly with a number of his usual sprint contenders now missing from the race. Under 5km and under 5 seconds as Giant-Alpecin bossed the chase-down. On the wide-open roads they had the lead trio in sight and were waiting to make the catch at just the right time. It came at 4km and unless a pursuit expert made an attack it was Degenkolb’s stage to lose. The final kilometer came all too quickly and Giant-Alpecin had given their all with riders from Astana, MTN-Qhubeka and Lotto Soudal all challenging for the win. As the sprinters opened up it was difficult to see Degenkolb because he was boxed in by other riders. As they sped to the line the German had to come around two other riders and power for the line but he got there a split second after the man from MTN-Qhubeka, Kristian Sbaragli who almost celebrated his win too early. “It’s a dream come true for me and it’s a dream for MTN-Qhubeka. This for all of Africa” said the delighted winner. 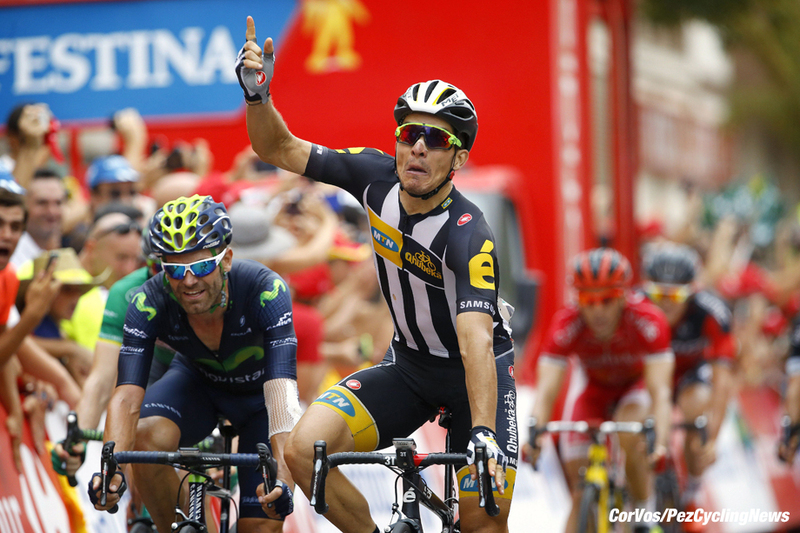 A super win for MTN-Qhubeka and a super tour for the team as the Vuelta heads in to the well-earned rest day. Keep it PEZ for a rest day round-up on Tuesday. 25. Christopher Froome (GB) Sky. 25. Maxime Bouet (Fra) Etixx - Quick-Step at 13:47.